We have proven ourselves to be the very best painting contractor in Modesto, Tracy, Turlock and Sonora Ca. We are a father and son painting team, and we pay very close attention to all of the details of the painting of your home or business. We paint residential and commercial interiors and exteriors. We can't say enough about this father & son team. We hired them to paint the inside of our house and they did such a great job we went ahead and had them paint the outside also. Professional, Detailed oriented, Quality work and they will work with you until the job is done the way YOU want it done! We now think we have the best looking house on the block and judging by the amount of people who drive by and slow down to look or stop to ask for AAA Paintings business card we might just be right. Great Job Guys! Thanks for the excellent painting of our home. Steve, you and your father Sam, were meticulous in every stage of the project, especially the preparation. We appreciate your promptness in scheduling and your timeliness in completing the job. The final product was fantastic. We will be happy, without question, to recommend you to anyone as the painters to paint their home. Steve, his Dad and AAA-Painters were a delight to have at our home. They were friendly and very easy to work with. Steve gave us an estimate--and stuck to it. He accomplished the exterior painting within a very reasonable time frame and maintained a neat and clean job site. When he was done, he cleaned up thoroughly. We found him to be an exemplar among all of the contractors we have had working on our new home. Dear Steve, Thank you for the great job you did on my home. It looks great!! Every time I come around the corner I get a big smile on my face - I'm so happy with how the house turned out. Many of my friends have complimented me the "new look. "Your attention to detail, and meticulous prep and clean-up really made the difference. I truly appreciate all the extra's - painting the outside lights, refinishing the front door, and staining the inside garage door. I really thought this was going to be a big job and a lot of mess, but your professionalism and extraordinary talent made it so easy. I commend you on your crew! They were very friendly, and helpful. Paul was very happy as we power washed and cleaned his home. Then applied a very thick coat of Olympic Natural Cedar Stain to his log home. It looks beautiful. The Olympic stain leaves a slight sheen which really keeps the wood looking new. Paul was amazed at how much less our price was to finish his home then the other companies who specialize in log cabins. John and I so much appreciate the wonderful paint job you did on our mountain house. Not only does it look wonderful--clean, fresh, and new--but it is now extra protected against the winter storms. The fact that you took the time to find the right paint for the different needs of the house--from the glossy paint on the railings to the two shades of stain on the deck--was great. Your work is impeccable and you did exactly what you said you were going to do when you said you were going to do it. We feel very pleased with the end result and the way it was achieved. Many thanks to you and your lovely wife Delena! What a "wonderful" way to have your house painted! Steve met our every request & threw in some extra to boot. Thank you for our lovely & perfect new home look. PS. Thanks also must go to Delena, Steve's sweet partner - what that little girl can do with a roll of tape! There are no words to describe what a beautiful job Steve did on our house. People always drive by and stop to look. He really went out of his way to help us find the perfect color. 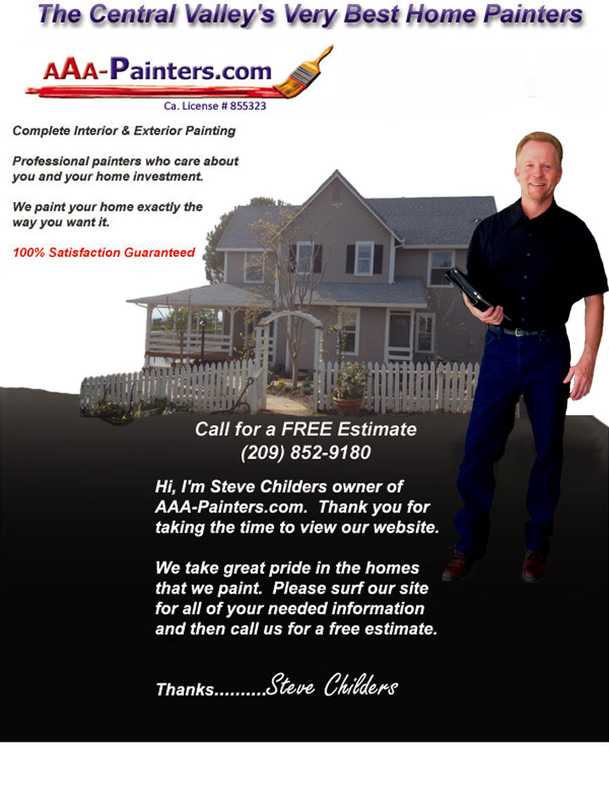 Steve Childers, AAA-Painters.com, aaa-painters.com, aaapainters.com, painters, best painters, cheap painting, custom painting, house painting, house painting, commercial painting, Lake Don Pedro, ca painting contractor, Painting Turlock, ca Painting Contractor, Painting Modesto, ca, Painting Contractor, Painting Manteca, Painting Contractor, Painting Tracy, ca Painting contractor, Sonora Ca, painting contractor, new homes, remodel Home, the deerwood corporation, home repairs. 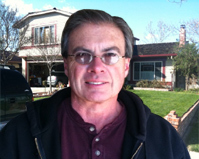 AAA-Painters.com is your best choice for Modesto Painters.